So far Guest Writer has created 31 blog entries. I agree that racism is still present in our society. After reading the article COLUMN: Racial injustice solution lies within us by John Dooman written on February 13, 2015, I realized racism has been around for a very long time and it’s not going away. The article mentioned how the media distorts events that have to do with racial issues, and I completely agree. I believe that writers can alter a story purely to create more interest and have more cultural sensitivity. I also agree with the writer when he says that racism will always be around. People can create opinions without even noticing it, and I believe the same thing can happen with a belief about another culture. However, I think that even though racism will never completely go away, we can all try our best to keep from having biased opinions towards another culture. For more letters, read the March 12 article LETTER: Superintendent cites auction’s legacy. You know how chatty I am. But this morning, I’m speechless (well, almost). It’s official. Kids Day 2015 had raised $535,000 for Valley Children’s! That money goes to patient programs and services, helping kids like Neymar, this year’s Kids Day Ambassador. A special “thanks” to all my newsie friends at The Fresno Bee, ABC30 Action News, KSEE24 News, KMPH FOX 26, CBS47 Fresno, KMJ, 93.7 Kiss Country, UnivisionFresno, Fresno State Focus and The Feather Online for covering the event! This couldn’t have happened without your support, as well! This was originally posted March 10 on Zara Arboleda’s Facebook page, linking The Feather Online and the other news outlets as Childrens Hospital thanks supporters. I do believe that service day brings out the best in us and that we don’t need a reward for serving, as the gratification from it is reward enough. In Rees Roggenstein’s article, he talks about how serve day brings out human kindness. I agree with your points of the warm and fuzzy feeling you get inside when you serve another, as well as the bleak, hollow feeling you experience after an act of selfishness. I can say that I have experienced both of these feeling many times and the spirit of serve day lives on. However, I have one thing to add regarding service. I feel as though a more genuine motivation for my desire to serve is that God has given so much to me, his forgiveness, grace and mercy makes me want to give back to the rest of the world to show my gratitude and thankfulness for all of my unearned privileges. For more letters, read the Feb. 24 article, LETTER: Respecting unique characteristics. 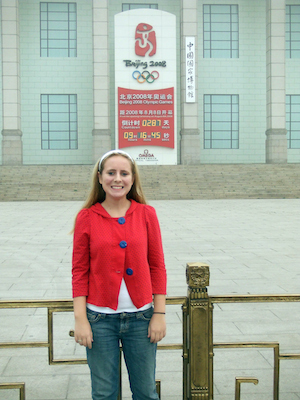 Alumna Molly Griffin, ’09, passed away after an auto accident, Feb. 21, and a family friend writes her good-byes. On Saturday, February 21st, 2015, Molly Griffin passed on from this life to the next. She is remembered and loved by the FC community, her family, and friends. 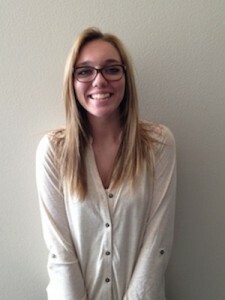 Molly Griffin graduated from Fresno Christian in 2009 as an honors student. She knew she wanted to go into the medical field, and decided to go into nursing so she could have more time with family, compared to doctors. She graduated from Fresno State with her nursing degree last spring, and by summer she was working at Madera Community Hospital in the surgical department. My sister, Abigail Schoettler, ’09, became friends with Molly when Abby transferred to Fresno Christian in 7th grade. By 8th grade, she was in a tight knit group with Molly, Katie White, ’09, and Brittany Schaffer, ’09. Abby and Molly remained close friends until her death. From being a young girl up until to present time, I remember Molly coming over to my house constantly. Since Madera Community is only 10 minutes from my house, she was over at my house on a regular basis. They talked about boys, build-a-bears, work, college and everything in between; but no matter what the conversation was about, Molly always made it entertaining. I am convinced that if she was not a nurse, she would become a comedian. Some of my sister’s favorite memories spent with Molly were when Molly and her mother surprised Abby by coming to the house on Christmas morning (Abby’s birthday), going on a missions trip in Mexico and forcing Abby to listen to Phil Collins, and, most importantly, Molly being by Abby’s side no matter what. If Abby had a problem, Molly would be outside our house, even though we lived 35 minutes apart. In 2007, the Griffin family took a trip to China to adopt a daughter, Paige, from Molly’s suggestion. Molly loved to spoil her younger sister and loved to do little things for her, such as the ‘Elf on the Shelf’ during Christmas time. Molly was killed February 21st when a drunk driver hit her and her passenger, Emily Krieghoff. Molly died at the scene, while Emily remains in critical condition at the hospital. Molly is survived by her parents, Doug and Doris Griffin, her sister Paige, now 10, and her older brother Joe. Molly, you are forever remembered by us, the FC community, and from my family; we are more than blessed that you came into our lives in 7th grade. Thank you for being a great friend to my sister Abby and to many others; you are missed greatly. We grieve for your loss, yet rejoice that you are with our Heavenly Father and experience no pain. Rest in Peace, Molly Taylor Griffin. A funeral in Molly’s remembrance was held Feb. 28 beginning at 10 a.m. at Clovis Hills Community Church. Teacher at FC, Robert Foshee, attended the event and was touched by what he witnessed. In lieu of flowers, the Griffin family is asking for donations to be made to the Molly Taylor Griffin Nursing Scholarship at Fresno State. Checks should be made payable to the Fresno State Foundation and mailed to 2345 E. San Ramon, M/S MH26, Fresno, CA 93740. Donors may also contribute online here. This writer can be reached via Twitter: @macyyvictoria. I believe service day is a great thing for our school. It is a way to glorify God and help fulfill the needs in our community. In Rees Roggenstein’s article dated Feb 18, 2015, he talks about how Serve Day instills student involvement. I agree with Superintendent Brown’s statement: “Service day is a great opportunity to expose students to the concept of serving and giving of themselves.” We are called to serve others as believers of Christ. Jesus came to serve humanity, providing the ultimate example for us. I Peter 4:10 states, “As each received a gift, use it to serve one another?” Service day is great, but we should be serving each other daily by our attitude and the small things with do for each other. Serving should be an everyday occurrence. It should be a lifestyle. Keeping your eyes above and your hands and feet below will reflect the serving nature of the Lord. 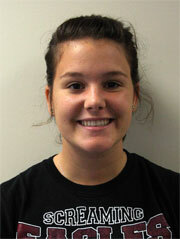 For more opinions, read the Feb. 18 article, COLUMN: Why every student should go to NOTS. This letter to the editor is in response to The Feather Staff’s Jan. 21 article, COLUMN: Pushing through. The statement that most New Year’s resolutions are just hollow words is too true. In Rees Roggenstein’s column, Pushing Through, he touches upon the topic that people make themselves promises without putting in the effort to keep them. We as human beings want to set our lives straight, promising ourselves that things will be better in the years to follow. But how can anything change if we don’t take action to change it? Rees mentions that the key to achieving success is commitment, perseverance and tenacity. I think that these frames of mind should be applied to any workplace, whether it be the classroom or the office. A good work ethic is the key to success in both life and career. As we come toward the end of the school year, we should strive to finish what we started. When we put forth our best efforts, the result will surely be success. The FC choral program will send three students to participate in the The Fresno Madera Counties Music Educators Association (FMCMEA) at Clovis North High School, Feb. 6-7. The Fresno Madera Counties Music Educators Association (FMCMEA) sponsors a director-nominated honor choir (and orchestra) each year. Students pay a small fee, and spend personal time as well as class time learning five songs chosen by the organization. This year the event is Feb. 6-7 at Clovis North Educational Center. 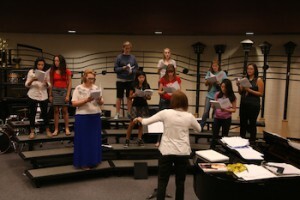 During three rehearsals, students gather at Clovis North High School and work with a conductor, usually a college professor. This year, the high school director is Robert Istad from Cal State Fullerton. The community is invited to the Shaghoian Performing Arts Center at 7 p.m. for the concert, which begins with the JH and finishes with the high school. Seven junior high choir students from Fresno Christian will participate and sing “Kyrie Eleison”, “Rattle on the Stovepipe”, “Little David Play on Your Harp”, “Festival Santcus” and “Shenandoah”. Susan Ainley says she is sending about 20 high school students, and they will perform “Liebenslust”, “Hallelujah”, “Requiem”, “It Was a Lover and His Lass”, and “Worthy to be Praised”. Ainley emphasizes the importance of this opportunity for her students. Senior Andrew Guthrie took on a challenging solo last year which helped him to become a better performer. Hannah Nale, ’17, tried out for a solo this year and is excited for the event. Ainley also points out that although FC has a limited amount of students, however, it does not limit their overall performance. Macie Thompson, ’19, received the only solo this year and was surprised at her lack of nerves. Those wanting to attend the honor choir performance at the Shaghoian Performing Arts Center, Feb. 7, can purchase tickets at the door: $8 for adults, $5 for students/seniors. The music begins at 7 p.m.
For more news, read the Feb. 4 article, Student Leadership: Valentines Day celebration plans. This letter to the editor is in response to The Feather Staff’s Jan. 16 article, EDITORIAL: Respecting boundaries of free speech. Your newspaper seems to have a very moderate position in regards to free speech. I agree that our words can have consequences, but I do not agree that we’re responsible for how others respond. People can decide how to respond to words or events. Because of this, I do not perceive Charlie Hebdo as responsible for the tragedy. What is offensive? Some people find certain things more offensive than others. Because of this, does that mean I should hold my tongue about everything? If that were the case, I would never speak again! Loads of people find Christianity offensive and repulsive. Does that mean we should stop spreading the Word? You will upset people, regardless of what you say or do. Joan Rivers made fun of everyone, and yet she wasn’t shot for her words. Also, in your article, I noticed you wrote that, “We grow up hearing that every human is entitled to his or her opinion (which is true), but does that mean that every opinion is right? In a land as varied as America, that claim is not possible.” Wait a darn tootin’ moment. Since the Feather believes not every opinion is right, I’m guessing it’s considering its own opinions as right. I would love the Feather to lead me to enlightenment about the truest, purest, and most perfect opinions. The claim of the American youths’ belief of free speech entitlement is also a broad generalization. I think your argument would be stronger if evidence from outside sources were included. Birth into a nation of rights does not guarantee a population of spoiled brats. Anyways, that’s all I have to say about that. Anyhoo, I thought your article was insightful and interesting. Thank you for offering an opportunity for deep thinking. For more opinions, read the Jan. 27 article, Generation neglects the morals of historical legacy. It is always a low moment for the whole nation when a student decides to murder his fellow classmates. Our own seemingly innocent youth becoming the dangerous enemy is something that tears at the hearts of each American. The attacker in these cases is often a troubled kid, either the victim of bullying or some kind of depression. However, the youth in question, Jaylen Fryberg, was seemingly enjoying his time in high school. This makes me think that there were some underlying circumstances to this shooting. Clearly, Jaylen had bottled up some sort of negative feelings inside of him. He may have felt anger at society for some reason, or sadness about something that happened to him, or guilt over some past event. These things devoured him and in the end, resulted in murder and suicide. This brings a question to mind: How could this tragedy have been avoided? I think that if he was able to open up and talk to people about the things troubling him, he would not have gone to this extreme. My challenge to myself and others is that if someone looks sad or troubled is to make an effort to talk to them and resolve whatever is wrong. I think encouraging words could have healed the emotional wounds that Jaylen Fryberg apparently had. 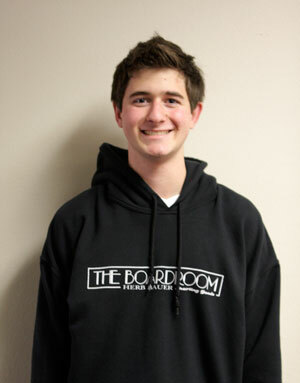 For more opinions, read the Nov. 24 column, Winter school spirit. The Feather encourages letters to editor, commentary, comments and guest articles. I strongly agree that Ebola is a highly dangerous disease and needs to be handled with the highest availability of care, I would definitely not want Ebola to spread beyond containment and cause an epidemic. After reading Rees Roggenstein’s Oct. 14, article, “Ebola virus continues to infect,” I agree that we should take the Ebola virus seriously. I believe the virus is a legitimate threat to many African nations and it is gradually becoming an increasingly real danger to America. While I still think that we need to continue to provide adequate health care to Africa, I also think that we need to make sure Ebola does not obliterate the general health of American citizens; if it does, then this disease is much more likely to become a global epidemic. However, consider the Ebola sensationalization inappropriate. There has been talk around the FCS campus, about fear of Ebola spreading around the facilities. Regarding this issue, I think the world health organization should not over exaggerate the severity of Ebola. However, I think that they should better educate us about what we can do to help this issue, without ‘sugar coating’ the whole problem. For more opinions, read the Oct. 15 editorial, EDITORIAL: Overcoming everyday excuses. 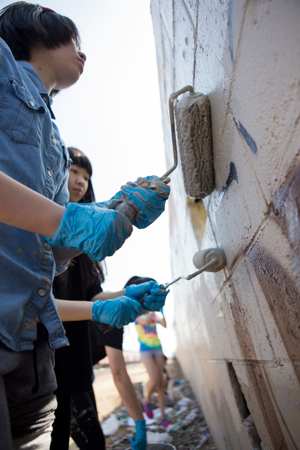 The City of Fresno’s Graffiti Abatement Team Supervisor, Jet Lim, has brought to my attention the outstanding work the Fresno Christian School students recently performed which resulted in a significant amount of graffiti being removed from public areas. On Thursday, March 6, 2014, nineteen (19) youths from Fresno Christian School went to the area of Marks and Shields and, for a 2-hour period, removed approximately 7,000 square feet of graffiti. Graffiti removal creates benefits that affect the community as a whole. Please accept my appreciation the Fresno Christian School’s involvement this summer and, hopefully, we can look forward to future collaborations. The campus divided into groups for FC Serve Day, March 6. Some volunteered at the Kepler Neighborhood School. This letter was originally sent to Campus Pastor Robert Foshee to thank the students for their service on FC’s high school serve day, March 6. Kepler Neighborhood School thoroughly enjoyed hosting your students on March 6. They very willingly dove into everything we asked them to do. We challenged them a bit in the areas of spacial reasoning and problem solving when we asked them to pack a pickup truck with music equipment, furniture and student’s art items that needed to be transported to a nearby studio for Art Hop that evening, but they exhibited great perseverance! They were all such good workers, in fact, they accomplished nearly all the tasks we had planned for them by lunch time! Because of this, they were able to take a walking tour through a bit of downtown Fresno, where our charter school is located. I hope this gave them a better idea of the many things downtown Fresno has to offer. We would welcome your students back again any time. After their visit, we talked about how nice it would be to have them back for an activity where they can work directly with our students rather than the cleaning and organizing they did in the basement storage (aka “The Dungeon”) and teacher resources rooms. An idea that came up was to have them assist in a field day or another similar special event. I know our kids would enjoy the experience. Thank you again for sharing your students with us. They were a tremendous help and a joy to have on our campus. For more opinions, read the La musica es un lenguaje universal. This year’s service day was a great way to teach the students of Fresno Christian the importance of giving back to the community. I had the privilege of bagging food at the Fresno Community Food Bank in South Fresno. The warehouse was filled to the ceiling with canned foods and all of them donated by local people and businesses in the community. I was able to work along side my peers bagging food items in grocery bags for the upcoming community food drive on March 29. While the work was repetitive, it was fun trying to put together the most bags, which also got the bagging done quicker. Our goal was to bag 1,500 bags within the three hours that we were there. Mission accomplished. Sarah Pedelty, the Community Food Bank volunteer coordinator, shared with us that when we were able to give a bag of healthy foods to family?s that cannot afford it. And the domino effect is that good, healthy food stimulates good work ethic for the parents to excel in their daily jobs and for the children to do better in school. I know that I take these things for granted. It is good for me to give back to the community. I would love to go back to the food bank, because it was a wake up call to the fact that I need to be more thankful of what I have. For more opinions, read the Feb. 28 article La musica es un lenguaje universal. As many of you already know, one of our very-involved music students and a FCS lifer, junior Andrew Guthrie, lost his mother very suddenly last Friday. Many of you have asked how you can help. Their church, Northeast Assembly of God, is coordinating meals and this would be a very practical way to show our love and care for the Guthrie family. Better yet, here’s a direct link to their meal schedule: takethemameal.com From there, a schedule will come up & you’ll see which dates are available. Their address and a map are also available if you need them. Thanks so much for your care and concern for Andrew and his family. Please continue to keep them in your prayers. This letter also appeared in the Feb. 4 article, Tragic losses affect campus family (UPDATE). For more opinions, read the Feb. 4 article Senior pursues alternate route after graduation. As part of an ongoing assignment in the Spanish III class, students will write bilingual articles, utilizing the language skills they build over the course of a year. The articles will be published every month, highlighting each students’ interests. 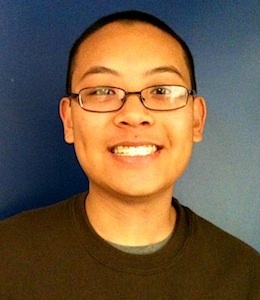 The sixth installment is written by junior Jordan Castro. La comunidad hispana en los Estados Unidos ha seguido en aumento en el correr de los anos. Los inmigrantes viajan a Estados Unidos para buscar una vida mejor. Algunas personas viajan en busca de un trabajo. Otros viajan para evitar la persecucion en sus propios paises. Mi familia tiene su propia historia. Mis abuelos son de Tijuana, Mexico. Mi abuelo viajo con su esposa en busca de un mejor trabajo. Mi familia emigro a la Isla Angel. En Stockton, Rueben recibio un trabajo en los ferrocarriles y formo una familia. Su hijo, Carlos, es mi padre. Nosotros vivimos en Clovis, California. Los hechos sobre los inmigrantes son muy interesante. Los inmigrantes son menos violan las leyes menos que otros y ayudan a la economia del pais. En 2012, un millon de inmigrantes solicitaron la ciudadania. Setenta por ciento de los inmigrantes son de Asia y America del Norte. Es positivo para un inmigrante viajar a los Estados Unidos. Los inmigrantes tienen una reputacion de presencia ilegal, sin embargo, nuestro pais es un pais de inmigrantes. Pero, lamentablemente, la mayoria de los estadounidenses se enfocan en el impacto negativo. Ellos no ven el crecimiento, el orgullo y la prosperidad de nuestra nacion en su conjunto. Yo soy la tercera generacion de mi familia a vivir en Estados Unidos. La vida como un inmigrante es especial. Mi familia tiene estas supersticiones extranas, por ejemplo, yo no hago nada nuevo, los viernes. La gente tiende a pensar que tengo bronceado todo el ano. Cuando les digo que soy mexicano, que recibo respuestas diferentes. La primera pregunta es siempre la misma. Es usted un inmigrante ilegal? No, yo naci en Fresno, y mi familia entre en America legalmente. A veces me burle de pero soy Jordan, no un estereotipo se puede clasificar. No cortar el cesped, y tampoco lo hace mi padre. Algunas personas incluso culpan a mi capacidad como atleta en mi genetica. Trabaje para hacer lo que puedo hacer. A veces me imagino lo que mi abuelo vivio cuando viajo a Estados Unidos. Como la gente lo trata? Estos matices raciales mantener a los estadounidenses de ser estadounidenses. Hoy en dia, el individualismo es valorada, pero esto ha provocado que perdamos nuestro sentido de unidad. Esta nacion es un pais de inmigrantes. Por que discriminamos? Immigrants today have less opportunity because of discrimination. These prejudices only separate us as a nation. Immigrants help the economy, and are less likely to commit crimes because of their fear of deportation. They come to America for the same reasons our founding fathers did: a second chance. The problem lies within society?s emphasis on individualism, which I do believe is important. The error in this lies when we consider others inferior or less because they are different. We as Americans draw attention to abnormalities. However, I would say this is an improvement in our history as a nation. I myself have experienced what it is like to be anything other than a white American. 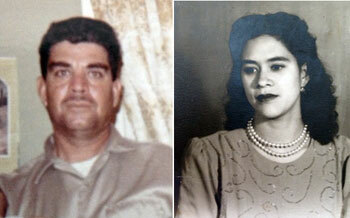 Some people joke about my parents having different colors of skin. Other people say I can run and jump because my family practiced while crossing the border. While some of these jokes are unintentionally hurtful, their existence condones the pain we inflict on each other. With science considered, or skin is a matter of pigment, not social class or a mark of inferiority. The only way I can change the discrimination I face is to draw attention to it, and teach those around me what it means to be a human, not a majority or a minority. For more opinions, read the Jan. 22 article, EDITORIAL: Partake in the equation for school spirit or read last month’s Spanish opinion article: Lo que aprendi de la clase de Espanol. The articles will be published every month, highlighting each students’ interests. The fourth installment is written by sophomore Jullianna Rosik. Soccer is a very important sport in the Hispanic culture. It brings friends together to cheer for their favorite teams. As a soccer player who often plays Spanish speaking teams, I receive the chance to view the Hispanic love of soccer in action. One way the Hispanics show their passion for soccer in during the FIFA World Cup, which occurs every four years. Next summer, the World Cup will be played in Rio de Janiero, Brazil. I am very excited to watch all the talented teams play in continuous high intensity games. Also, I enjoy seeing the Hispanics in my community showing their team spirit and cheering for their favorite countries. Futbol es un deporte muy importante en la cultura de hispana. Como futbol americano, futbol es un juego que junta a los amigos animar para sus equipos favoritos. Ese es el depote que se juega en el mundo. Porque yo soy una jugadora de futbol, tengo experiencia primera mano de la importancia del futbol para los hispanos. Muchas veces cuando tengo un partido, el otro equipo coniste mayormente de jugadores que hablan espanol. Los jugadores y entrenadores son apasionados por el deporte. Otra forma en la que los hispanos muestran se passion por el futbol es en la Copa del Mundo. La Copa del Mundo para los hispanos es lo mismo que El Super Bowl para americanos. Resalta el epiritu de equipo de todos las personas de todos los paises, y es mas popular en otros paises. El proximo verano, la Copa del Mundo FIFA 2014 sera en Rio de Janiero, Brazil. Estoy muy emocionado por ver todos los partidos en la television porque a mi familia les gusta el futbol. Tambien, me gusta ver a los hispanos en Fresno aplaudir a sus equipos. Espero que el equipo americano gane. A veces, me gustaria que el futbol fuera mas popular en los Estados Unidos. Aunque nuestro pais tiene una gran poblacion de Lationamericanos, el futbol todavia no es tan importante como en otro paises. Estoy contenta que la cultura latina puede apreciar al futbol como un deporte. Eso implica mucho la habilidad, la dedicacion, y el esfuerzo. Tal vez un dia todo el mundo vera que el futbol, en mi opinion, es el mejor deporte. For more bilingual articles, read the Oct. 29 article, Espanol en el lugar de trabajo. If you are anything like me, you probably feel like you spend half of your time looking for things that you misplaced. With the chaos of our busy lives it can seem impossible to stay organized. At my stage in life it’s pacifiers, sippy cups and car keys to keep track of; however English essays, calculators and soccer cleats may hit closer to home for you. When it comes to college applications, scholarship deadlines and the FAFSA, in addition to your already hectic life, many seniors become a little psychotic around this time of year. In order to stay organized during this season of life you must first get organized. Maybe you are not a “Type A” person, but it doesn’t matter; when it comes to college applications you have to keep track of everything in order to survive. Folders will collect all that you receive from a college in one place so you won’t have to sort through, let’s say, Northwestern University’s materials when looking for information on University of Michigan.–Jane Shropshire, founder of Shropshire Educational Consulting LLC. My first recommendation is to purchase a binder to contain “all things college.” It is important to separate your college stuff from your school stuff, both in your mind and physically. 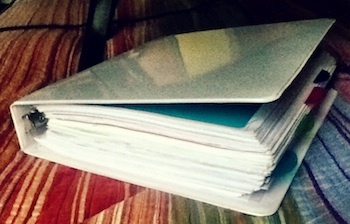 Once you have a binder, divide it by sections, according to colleges you are applying for. “Folders will collect all that you receive from a college in one place so you won’t have to sort through, let’s say, Northwestern University’s materials when looking for information on University of Michigan. Use your calendar/planner to track applications and target dates for completion,” advises Jane Shropshire, founder, Shropshire Educational Consulting LLC. As previously mentioned, it is important to use a calendar. “Put it where you will see it every day, whether that means taping it up in your locker, attaching it to your bathroom mirror, or putting it on your handheld computer or smartphone. Use different colors for different colleges,” CollegeDate advises. If you use your phone you can even set alerts at certain times to remind you to write your personal statement, fill out a scholarship application, ask for a letter of recommendation, etc. You may think you can keep it all straight in your head but you can’t, no one can realistically do so without forgetting something. Why take the chance when it is something as important as college? In helping students during this stressful time I have noticed how many people forget their usernames and passwords for the application websites and college email systems. At the time, you create a password that you believe you will remember but with so many to keep track of it is easy to forget which one is which. Rebecca Joseph, executive director and founder of Get Me To College recommends that you keep all of this important information in one place, by using Mac Stickies or a Microsoft Word document. This will save you the hassle of having to change your password, getting locked out of the site, or even waiting on hold for hours (we have all been there). When it comes down to it, proper organization can be the key factor in creating a successful college application experience. Organization leads to meeting deadlines, meeting deadlines leads to getting into college and possibly scoring money for college and these things lead to happy students and parents (and school counselors). So the moral of the story is to stay on top of things because your hard work and organization will most definitely pay off (in more ways than one)! For more opinions, read the Nov. 12 article, Freshman princess relives first homecoming . Here are a list of three spooky Haunted Houses, Corn Mazes and Haunted Forests to finish it off. Most kids under the age of ten are encouraged to come but to stay away from the Haunted house and the Haunted Forest. Although kids are not encouraged to go on the ‘scary’ attractions, they are strongly encouraged to dress up. For the younger kids there is a Haunted Hayride that is very kid friendly. Hobbs Grove: (559) 356-3958. Cobbs Ranch: (559)240-5516. These lists of websites are full of kid friendly things to do. Located on Clovis Ave and Jensen, Simonian Farms goes from October 8-31. The cost is free therefore many people will be there. The 11th Annual Haunt in the Park. 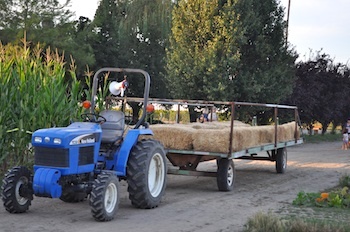 At $2 kids can enjoy weekend hayrides along with free haunted caboose rides and a corn maze! Please contact (559)-439-0606. The 20th annual downtown Sanger Halloween party is a great alternative to just trick or treating. Rather than sending your kids out alone to go get as much candy as they can, you can send them to the Downtown Sanger Halloween party! Located at 7th & N Street. If you decide to have your kid go off and hang out in the Halloween party there are lots of alternatives for you and your spouse to do like dinner and shopping. If you have any questions here is the Sanger Chamber of Commerce ? (559) 875-4575. They will also be serving hotdogs for all the little ghouls and goblins. The Sierra Vista Mall has a trick or treat from 3-5 pm. All children under the age of 10 are encouraged to come dressed up. All children 10 and over are encouraged not to wear masks, though they are still encouraged to still dress up. For another list of events, check out the Fresno Bee’s article Halloween events for kids planned around the Valley. For more news, read the Oct. 28 article, Epitome of school spirit celebrated at homecoming game (VIDEO). Alumnus, Brady Lee, ’12, earned the first place prize and a check for $500 at Biola University’s Punk ‘N Pie talent show, Oct. 25. Punk ‘N Pie is the name of Biola’s annual Fall talent show. The name comes from “Punk” (loud rock and roll music) and “Pie”referring to the pumpkin pie that is freely served after the show. Each year the show takes place on Biola Weekend so that parents, family, and friends can enjoy the show as well. Punk ‘N Pie is put on by Associated Students (AS), Biola’s student government. 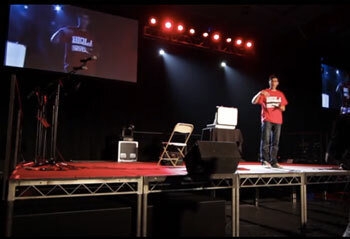 Biola’s gym was filled to capacity with 2,300 people. Hundreds watched the show from an overflow sight outside the gym. Ten acts showcased talent ranging form dancing to spoken word. After a brief intermission, the emcee’s introduced Lee. Rather than being nervous, he said he felt at peace. He was able to feed off the energy of the excited audience. Lee’s parents, grandparents and older brother, alumnus Spencer Lee, ’10, attended the performance to cheer him on. Lee says it was extra special to have his dad watching in the audience. Ever since he began learning sleight of hand as a ten-year-old, Lee has enjoyed wowing friends, family and strangers. He plans on using some of his prize money to expand his repertoire. Lee is a Christian Ministries major. After graduation he plans on attending seminary to receive more training. Lee wants to become a senior pastor who equips people for the work of ministry. Lee chose to attend Biola because of its strong commitment to Christ-centered education. He loves the classes, professors, students and food. He also enjoys the fact that the campus is so close to Disneyland and the beach. Along with six other Biola students, Lee will be serving in India from January 1-22. They will be ministering in orphanages as well as schools. Lee has applied to go on the trip because he wants to be a part of what God is doing overseas. He has a heart for the needy and wants to show Christ’s love to them. For more features, read the Oct. 29 article, Fall festivities: Join the discussion. For more information on Brady Lee’s upcoming trip to India, please contact him via Brady Lee’s email. 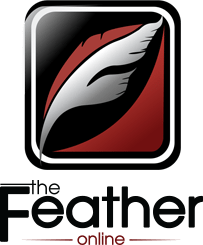 Follow The Feather via Twitter: @thefeather. Note: YouTube video may not be accessible on campus due to new restrictions. Anger, revenge, and bitterness deeply affect the outcome in Shakespeare’s tragedy play, Hamlet. The main character, Prince Hamlet, is weighed down by a cluttering of emotions after he learns his mother married his father’s potential killer. Hamlet faces the ultimate consequence of death, due to his paranoia and twisted mindset. Not only did he end up dead, all but one of his loved ones suffered as well. Yet if Hamlet made different choices during this critical time, the outcome could have been positive, or at least less tragic. I can understand how Hamlet felt because I have had mishaps throughout my life that have made me feel left out and hurt. I’ve had numerous experiences when plans were made and no one came through because something better came up for them and I was left in the dust; I felt used and betrayed just like Hamlet. When facing these kinds of situations, I’ve learned that honesty usually turns out better than lying and sneaking around. I believe lying is only a temporary solution to a problem; usually it will backfire in the future, or my conscience may eat away at me for internalizing the deceit. At the outset of the story, the ghost of Hamlet’s father triggered his first, and most powerful, emotional instinct. Instead of being rational, Hamlet behaved in a way that made his friends and family accuse him of becoming crazy. He never questioned whether the ghost’s words were the truth or not, or if it was even a demon or an angel. He behaved childishly by becoming impatient and not trying to think things through. If he had acted in the opposite manner, death would not have been as common; open and honest confrontation could have avoided even more hurt. Hamlet even ignored advice from his best friend, Horatio, during the whole play when he was the only one who really cared for him. Even though the situation in Hamlet is most likely irrelevant to this century, we all still deal with the same feelings. When we have strong emotions, our first reaction isn’t always the best one. Most of the time, our minds get flooded and can possibly become our own worst enemy. As followers of Christ, we are commanded to be honest and not try to deceive God, others, or ourselves. Staying away from situations that could tempt or trick you can make it easier to not struggle with deceit or anger in the first place. Though it’s unrealistic to think we can avoid every one of these instances, prayer and intimate discussion with someone trustworthy can be an encouragement to do the right thing, instead of relying on emotional instability. When I face these kinds of situations, my mom is the one person I feel I can turn to for emotional and physical support when I am facing a problem in my life. As I, and many others, head off to college, we need to make sure that we have all of these support systems intact, because we will continue to face many new and challenging situations as we enter this next chapter of our lives. We will always have friends, but the challenge is to keep the true friends close and use them for support through rough times. 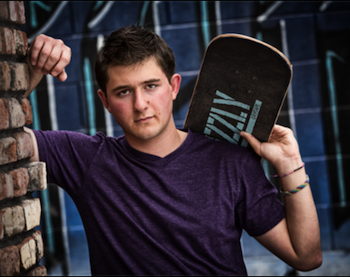 Nick will be attending Biola University next fall and is considering to major in business. For more opinions, read the March 19 article, COLUMN: Senior resolutions. Many seniors look forward to spring break because it offers them a time of relaxation after a period of anxiously waiting for college acceptance letters. Some families like to take a vacation during this time so that everyone can be together, while others like to stay home and spend time with friends. I love spring break, because I feel it is the mid-point between Christmas break and the end of the school year. After spring break, it only feels like a month or so until we are out of school. Although this week can serve as beneficial time to rest, I feel like it should be a time when seniors go out and do something new that they normally wouldn?t do during break. We should rise to this challenge; the majority of the seniors are leaving for college at the end of Aug. We’re counting down the days until the time when we wont be here every day anymore. I wouldn’t want to miss out on an opportunity during my last spring break in high school just because I’m feeling lethargic. There are many options that people can choose from to get involved with their community. For example, volunteering at Break the Barriers, counseling at a camp or feeding the homeless at the Poverello House would all be great ways to spend spring break. Because there are unlimited options, I would encourage everyone to find ways to become involved in areas that they are passionate about. After we graduate, there will be a multitude of chances to recuperate and alleviate our stresses. Why not use our final spring break as high school students to leave a positive impact on those around us? Because we are maturing into adulthood, we should be learning how to make our own choices instead of asking those around us to make decisions for us. We shouldn’t be waiting around for opportunities to fly by; we should make resolutions to be going out in search of them. I really enjoyed reading Jason Kim’s wonderful article, Kawashima recalls internment camp experience (VIDEO, PODCAST), published on Feb. 22, 2013. Hope Kawashima is actually a relative of mine. She is my cousin’s grandmother so I was astonished to see that she is in a Fresno Christian article, telling about her childhood experiences! I felt a little proud that Kawashima was willing to share about her imprisonment and the uncomfortable environment she was placed in due to the interment camps. I am glad that I don’t have to live in that kind of environment myself. I agree with Jason Kim that it is unfair that innocent Japanese Americans had to be imprisoned just because vicious Japanese soldiers attacked Pearl Harbor. Many Japanese Americans learned perseverance and forgiveness as a result of living in the internment camps. To be honest, I cannot think of any adjustments for this article. It is well written. I also want to let you and the writer know I appreciate the fact that you both took the time and trouble to write and edit this informative article. I hope I will have time to read more of your articles on The Feather. For more Letters to the Editor, read the Feb. 27 article, LETTER: Social media creates bullying. Many minors nowadays use media as a source for connecting and getting the latest news of different everyday events. Yet many strangers around the world can retrieve personal information. And the privilege of freedom of speech creates lack of trust in people we face. The Feb. 22 article, Part 2: Online bullying increases in schools (VIDEO) by Tynin Fries, focuses on the process of how bullies create havoc for others on the Internet. A form of cyber bullying starts when people leave traumatic comments or hack accounts within websites. Then they target another person’s account; who they know in real life. The freedom of speech online through secrecy can get out of hand, as some people throw all their anger out in a repulsive threat. This often damages the fragile lives of individuals. Unfortunately, one bully can turn into a cyber-gang as other anonymous people join anywhere around the world 24/7. Until today I have never used Facebook, Twitter, Instagram etc. ; for I’ve seen people post photos and messages virally (only available) to their friends through a social network, and think it’s secure. Anyone can easily leak the information, and in return use it as a threat. I am aware of the opportunities media brings for employment, and lots of them still exist through face-to-face paperwork. But social media creates bullying. Online bullying doesn’t always occur through creating a Twitter account. It can appear through newspaper articles or a video of a dog playing fetch with a lemon on Youtube. If cyber bullying arises, documentation of the inappropriate content is mandatory. Also please be aware of the consequences when using unsecure websites. People will always find and give their negative opinions. However with knowledge of the possible outcomes, unnecessary havoc remains preventable. For more letters to the editor, read the Jan. 18 article, LETTER: Safety precautions impact individuals. Being African American can sometimes be a struggle, but in my opinion, I see it as a personal honor. I was born on May 23,1998, in Madera Community Hospital. Immediately after that, I was put into foster care. A few months later, I started having home visits with the Krohn family. Home visits turned into weekend visits and they wanted me back. 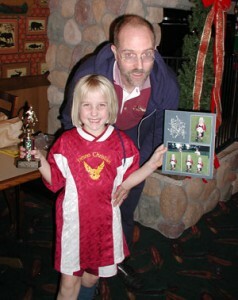 Then, on September 8, 1999, I became Emmaline Michelle Krohn. It was so weird adapting to the atmosphere of an all white family. When I was little, I didn’t notice the color difference at all when I would play with older sister, Olivia. Getting older, however, made me start to realize that my family and I have many differences. When my mom did my sister’s hair each morning, she didn?t do mine. My mom would take me to special places to get mine done because she didn’t know how to do it. My siblings learned how to swim really fast. Unfortunately, learning how to swim took me longer because African Americans are built with more muscles so it is harder for them to float. When I grew old enough to realize that I was different, I would get so mad at God for creating me a different color. Then, when I was about ten or twelve, I saw the movie The Blind Side, about the football player Michael Oher; it changed my whole opinion. Watching that movie made me realize that the Michael Oher family treated him no different. I thought everyone didn’t like, or care about, African Americans. That’s when I realized I was the one making those conclusions, and that I should instead always try to honor them. When people make comments about me being “white washed” and not like other black people at my school, I ignore them because I know that I was made African American for a purpose. For more columns, read the Feb. 14 article, Say no to ‘senioritis’. As seniors start to receive acceptance letters from colleges, the feeling of laziness and lethargy that kicks in for many is known as “senioritis.” We all feel like we deserve a little down time after working hard for three and a half straight years. Having a letter in our hands gives us not only a sense of maturity and accomplishment, but also a feeling of growing up. Most of the kids in our senior class know that senioritis is all talk and nothing but a joke because schools actually do care about senior year for most applicants. The current students who messed around as underclassmen now have to work twice as hard as seniors, even if they once looked forward to a lesser workload. I was a freshman who came in strong-headed and cavalier, not having any of my priorities straight. I thought that my future was many years away, and never could have imagined the impact that freshman year had on my college acceptance status, until becoming a senior this year. Now, instead of being able to have some relaxation time, I still need to focus on grades, subject test scores and everything else. This is a lesson to all because teachers know that all grades in high school count, and they would not advise their students if they didn’t know what they were talking about. I am writing this to help the underclassmen that think that they have everything together because I want them to learn from my mistakes. They are not the only ones who are going through it; there are many other participants. One thing that I did was prayed. My advice would be to pray to God and just ask him for perseverance. Without any prayer, it is impossible to accomplish the task because God is always the way to everything. He will fulfill your prayer; all you need to do is trust in him. Just note that your early years of high school mean everything, and they portray your academic future. Don’t become discouraged if you are in the position I was in, just make the turn around from here and make tomorrow the day that you decide to make the change. For more opinions, read the Feb. 12 article, Anchor offers tips for podcasting. As senior year approaches, many juniors stress over college planning. The article, “Tips on scoring cash for college,” posted by Michelle Warkentin, Dec. 10, gives useful information to students who are preparing for college. After I read this article, I had developed new knowledge for my future education. We all know colleges are expensive and that is why we need scholarships. Warkentin wrote important tips on learning how to earn these scholarships. She also recommended students to get a head start at preparing ahead of time. Many key points to succeed in college were covered in this article. Since college does not seem so far away anymore, the next chapter to my life seems so much closer. Now I understand the scholarship process more, giving me a head start in knowing what scholarships are more applicable to me. Now I will actually start planning ahead to see what scholarships I can earn. I found this article, in particular, very helpful. For example, I now understand the requirements in earning scholarships to colleges. This article also gave me encouragement to stay strong and push through my last years of high school. I recommend that every upperclassman read this article, so that they too will get a better understanding on college preparations. In senior English class this year, we read “Babette’s Feast,” a short story about what it means to find joy. The narrative seemed to teach the lesson that joy lasts forever, but happiness is only temporary. True joy can only be found through prayer, because we need God?s help in order to achieve it throughout life. We can all experience joy this Christmas season by giving to our loved ones and peers through sharing God’s love and encouragement with them. Most people consider giving as a physical action, not a spiritual one. Everyone purchases gifts during Christmas, but I think we need to realize that sometimes the best gifts are not the tangible ones. If we recognize this, we can learn how to give and fulfill the word of God, and how to start on the path that God?s word commands us to follow. We have the opportunity to find joy on this path when we show others the power God has over us, simply by trying to live our lives for him. In my own experience I have tried to do this when we spend time with my uncle and his family during Christmas because they are not believers. I try to show them through my actions what God commands us all to do such as obeying my mom, treating others kindly, and being true to myself. The fact that we understand how he is always there for us and that he will never leave us is an example of searching for the Lord in a way that could direct someone else to him. We also have to realize that joy can only be achieved through asking him for it, because we as humans do not have the capability of learning it on our own. I would like to challenge the readers to use this season of celebration as a chance to be a role model to those surrounding you, maybe even helping change someone’s perspective on the joy our father in heaven portrays to us. Sharing the hope of God and his word can simply mean living by example; it’s not always about questioning someone?s beliefs. Let’s all practice some self-reflection this season to see how we might improve our witness as we approach Christmas, because the ultimate joy a Christian can gain is knowing that they positively impacted someone’s faith. For more letters, read the Sept. 7 article, LETTER: I love FC Underground. Great articles in The Feather about Rick Steves and Town Hall. I’m so pleased you are taking the time to give your students the opportunity to practice first-hand the journalism experiences you are teaching them in the classroom. I’m sharing the articles with the Town Hall Board this morning so they can see the impact the lectures have on the students. Keeping students at the heart of your teaching is evident that you are great teacher. We look forward to seeing your students at each lecture. This letter is in response to the Oct. 13 article, Rick Steves to give Town Hall lecture. I am thankful for all that Fresno Christian has given me and how it has aided me in my growth. Like a lot of you will, or have already, I have spent my critical developmental years on campus and it has been a home away from home. Sometimes I wonder what it would have been like to go to a public school; they provide more AP classes, a larger variety of sports teams and all sorts of clubs. But then I remember that I would not have been able to experience as many extracurricular things as I did here, even if I went to a school that offered more. While offering an excellent academic program, the ability to schedule club, sports or activities into my day has given me a full, rounded education. This is the reason Fresno Christian High School is so special: Multiple extracurricular activities are offered and students have the opportunity to pursue many of them each year. I have participated in basketball, cross-country, choir, been a member of the California Scholarship Federation and student leadership. At Fresno Christian we see students who play football but also are involved in band, clubs or are on the cheer team and are heavily involved in the school publications. FC students themselves blur the lines of jocks, musicians, artists and the academically gifted. I do not think I need to emphasize how extracurricular activities have impacted my Fresno Christian walk. It is outside the classroom that I have learned the most: teamwork, leadership, social skills and commitment. As I leave this school, I hope that I am not the only one taking advantage of all our school has to offer; I encourage everyone to try new endeavors. FC rounded my education and I’m glad for it. There is no other place with as many opportunities, as much passion and personal impact as Fresno Christian Schools. 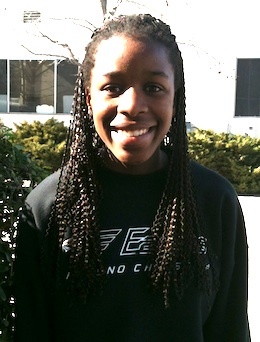 Senior Tatiana Fontes was the 2009-10 ASB president and will attend University of California, Santa Barbara, in the fall.